Powdered eggs are an easy convenient alternative to fresh eggs. They store easily, let you prepare baking mixes in advance, and are convenient to use. Easy storage: Long shelf life. No refrigeration required until reconstituted. Economical: Great deal, especially when egg prices rise at the grocery store. No wastage of perishable fresh eggs. Convenient: Make cookie & cake mixes, pancake & waffle mixes etc. in advance. Even share as gifts. Healthy: All the health benefits of fresh eggs, rich in protein, iron, and vitamins. 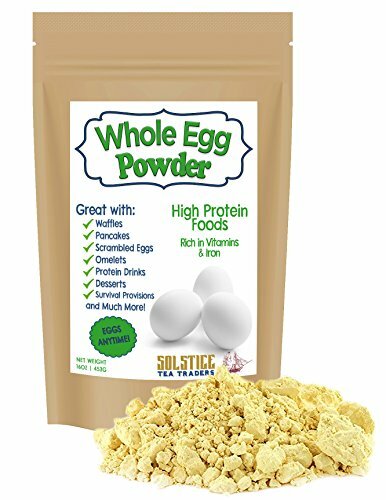 Powdered eggs also make a great pet food protein supplement for cats or dogs. Also available on Amazon in bulk 2-pound size. If you have any questions about this product by Solstice Tea Traders, contact us by completing and submitting the form below. If you are looking for a specif part number, please include it with your message.